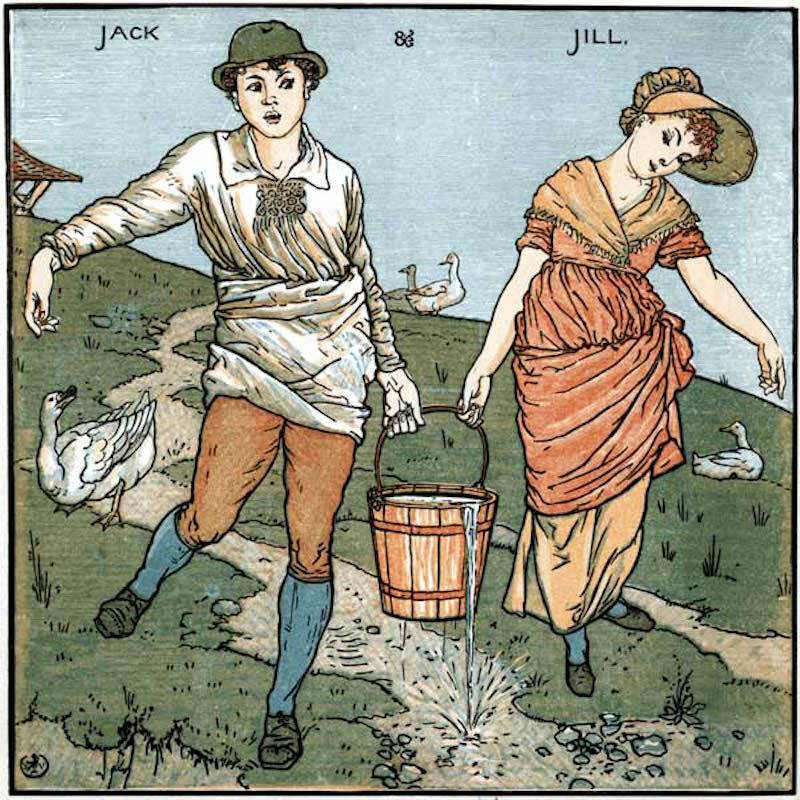 Walter Crane, Jack and Jill, 1877. Illustration from Walter Crane’s The Baby’s Opera. I adore it when I see two people—today it was, from the looks of it, a mother and child here on Canal Street in Chinatown—sharing the burden of a shopping bag or sack of laundry by each gripping one of the handles. It at first seems to encourage a kind of staggering, as the uninitiated, or the impatient, will try to walk at his own pace, the bag twisting this way and that, whacking shins or skidding along the ground. But as we mostly do, feeling the sack, which has become a kind of tether between us, we modulate our pace, even our sway and saunter—the good and sole rhythms we might swear we live by—to the one on the other side of the sack. I suppose part of why I so adore the sack-sharing is because most often this is a burden one or the other could manage just fine solo—which makes it different from dragging Granny’s armoire up two flights of steps, say, or wrestling free a truck stuck hip-deep in a snow bank. Yes, it’s the lack of necessity of this act that’s perhaps precisely why it delights me so. Everything that needs doing—getting the groceries or laundry home—would get done just fine without this meager collaboration. But the only thing that needs doing, without this meager collaboration, would not. Ross Gay is the author of three books of poetry, including Catalog of Unabashed Gratitude, winner of the National Book Critics Circle Award and the Kingsley Tufts Poetry Award; Against Which; and Bringing the Shovel Down. He is a founding board member of the Bloomington Community Orchard, a nonprofit, free-fruit-for-all food justice and joy project. He teaches at Indiana University. From The Book of Delights, by Ross Gay © 2019 by Ross Gay. Reprinted by permission of Algonquin Books of Chapel Hill. All rights reserved.